Elizabeth Schedl is the Chief Operations Officer at Hudson Pride Center. She is a community activist who works for LGBTQ+ rights and equality by bringing awareness and education to the local community. She started her career with Hudson Pride in 2013. Over the years, she has worked to strengthen the Center’s services and cultural programs for both the youth and adult LGBTQ+ populations in Hudson County. In her time at Hudson Pride, she has worked to develop and maintain new and existing Center partnerships with outside agencies, businesses, community organizations, and individuals to advance services to the LGBTQ+ populations. 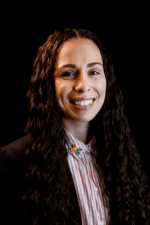 Elizabeth supports the development and implementation of the Center’s strategic plans and policies, provides leadership and direction to the various outreach programs, and direct supervision to all the staff at Hudson Pride. Additionally, she is responsible for reviewing the quality of the Center’s programming and procedures, organizing programs and reporting program outcomes, and assisting with grant-writing and fund-raising efforts. Elizabeth is currently the Chair of the Early Identification of Individuals with HIV/AIDS (EIIHA) Committee and an active member for both the Executive and MAI Committees in Hudson County. She is also a committee member of both the Municipal Alliance to Combat Alcoholism and Drug Abuse in Jersey City and the NJ Prevention Coalition in Union City. Finally, Ms. Schedl sits on the Committee for the Hudson County Alliance to End Homelessness. In college, Elizabeth co-founded and ran the first LGBTQ+ organization that focused on awareness and support through meetings and events at her University. Besides supporting LGBTQ+ persons on campus, this organization aimed to outreach to the campus community as a whole and develop support in the external community. After graduating with a Master’s degree in International Relations, Elizabeth held an internship in Washington, DC at an LGBTQ+ political organization, where she worked to get openly LGBTQ+ candidates elected to office. She is a proud lesbian activist who believes in equal rights and representation for all LGBTQ+ people.